One of the main uses for an android Tablet or phone is for taking photos. However because the storage space on phones and tablets is limited they can quickly use up all of your available storage space. In this tutorial we will look at how you can manage your photos to ensure that they don’t get lost if you lose your phone/tablet, or if it breaks. In addition we look at how to ensure that they don’t use all of your storage space, but at the same time they are easily accessible. You will probably find your photos in the DCIM folder directly under the root of your file system. It is useful to install a file manager (e.g. Astro ) so that you can easily view your photos. 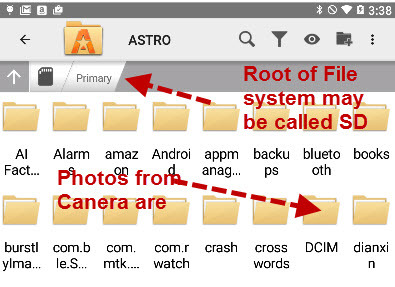 The root of the filesystem is called Primary in the Astro file manager, in others it is usually called sdcard. To prevent photos consuming all of you available storage space and to make sure they are safely stored you should move them to a more permanent storage space. There are several ways to do this and several storage solutions available. On the Internet Using Cloud Storage e.g. Google Drive. We will explore each of these possibilities in turn. You will need to have a file manager to do this and you can transfer the photos to your PC using USB or using wireless. Remember the photos are located in the DCIM folder on your device. Once you are happy that the files are on the PC/Laptop then you can delete them from the tablet/phone. To do this you will need a cloud storage account like Google Drive and the Google Drive App installed on the Tablet. You can then use a file manager Like Astro File Manager to copy the photos to Google Drive and once they have been copied you can safely delete them from your tablet. To do this you will need to install the Google Photo App. At the top you will see a link to the backup and sync settings. You will need to enable it on the top right if it isn’t already enabled. 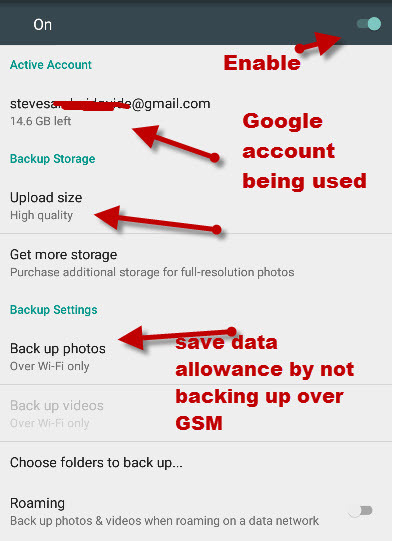 By enabling it your photos will be automatically backed up online to your Google photos account. The account you are using is shown at the top. If you have more than one Google account you can change it here or you can add another account. Further down you have two important settings the first is picture quality. By default Google with compress your pictures and stores lower quality images for free in Google photos. You might want to change it to original size which store the photos without quality loss, but they count against your Free Google drive storage. 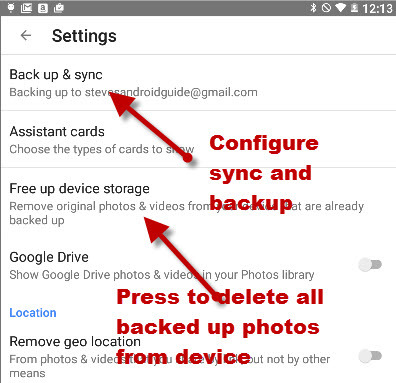 The other setting called Backup up Photos lets you enable/disable backups when you don’t have a Wi-Fi connection. Because most mobile data plans have only a small monthly data limit, and charge if you exceed it, this is normally set for Wi-Fi only. These are two separate Apps, but you can view your photos in Google drive by enabling it in Google Drive. 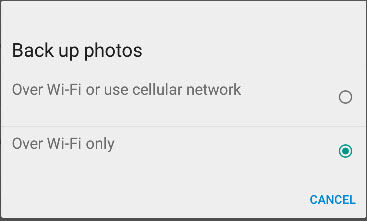 I don’t believe you need the Google Drive App installed on your device for Google Photos to work but they are usually both installed anyway. 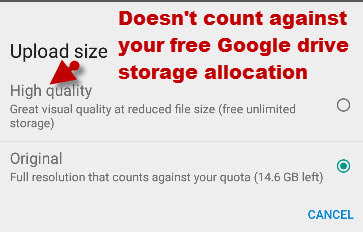 You should note that all Google accounts are allocated 15GB of free storage on Google Drive. If you choose the high quality option when backing up then it doesn’t count against this free allocation but if you choose original quality then it does.